I just read the best parenting/family book of 2008 (okay, it was published in 2007, but I just read it…). It’s revolutionary actually. It will rock your perspectives, alter your thinking, and change your world (literally). 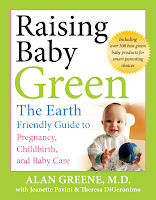 It’s Raising Baby Green: The Earth-Friendly Guide to Pregnancy, Childbirth, and Baby Care by Dr. Alan Greene. When I first picked up the book, I didn’t have particularly high expectations. I thought it might be slightly too hippie or agenda-laden for my taste, but Dr. Greene sucked me in from the very first pages. I underlined and nodded my head and underlined some more. I read passages aloud to my husband. I turned off the lights and opened our blinds to read by the window (it’s important to conserve electricity and energy, you know). This book inspires action. It compels the reader to DO – to step out and make incremental changes to better our children’s lives, our own lives, and our world. You’ll learn how to make simple lifestyle changes for your baby in the womb, in the labor and delivery room, in the nursery, in the kitchen, in the bathroom, and beyond (those are the chapter titles). You’ll find out what it really means to buy organic (and how to get started), how to choose baby care products that are free of harmful chemicals, whether cloth diapers or disposable diapers are better for the environment (the answer might surprise you), and how to treat ear infections (don’t just reach for the antibiotics). The wealth of information is astonishing, but it’s presented in a concise, easy-to-read-and-digest format. The book makes excellent use of white space, illustrations, and cool text boxes with “Try This Today” tips, “Buying Green Guides” (that showcase various green products), and “Green Baby Stories” (which share tiny tales of how other parents are going green). If Dr. Greene hasn’t made it on the Oprah show yet, I expect (and hope) that he’ll receive an invitation soon. Greene has created the only baby care book that specifically focuses on “greenness” (it’s about time, by the way). Buy basket for home office to recycle scrap paper and mail. Buy organic produce, milk, and beef. Discard scary plastic toys with toxins and chemicals. Discard “baby care” products that are unneeded. Live simply. Love fully. Remember that materialism is bad for the environment and for our hearts. WIN IT! One mama will win a copy of Raising Baby Green: The Earth Friendly Guide to Pregnancy, Childbirth, and Baby Care by Dr. Alan Greene. To enter, simply leave a comment and your e-mail address on this post by Monday, March 3, at midnight. The winner will be announced and contacted on Tuesday, March 4. * Winner must provide a U.S. mailing address. * UPDATE * The winner is #106 mommie. Congratulations! Blogger wouldn’t let me leave a comment last night. If it’s not too late, please include me into the contest! THanks! I would learn alot from this! What a great book! I’d love to win. Oh this is a nice book. I really need this one. I have someone very close who really could use this book. thanks so much for having this contest. We are definitely wanting to be greener!! Count me in! this sounds great, please enter me, thanks! Great giveaway. I just posted some ideas about having a “greener” Easter basket – every little bit helps, right? Thank you for the opportunity. count me in, we are starting to live greener!! My pregnant daughter tries to live aa “GREEN” a life as possible. This would be perfect for her. We’re making “baby steps” to becoming greener. This wouls be great to speed the process up and get our whole family off and running…. I would love to win this. Thanks! Having my son has opened up a whole new world to me that I didn’t know existed. I have a lot more to learn about being green. Sounds like a great book. please enter me. Thanks. I’m trying to do everything as green as possible (within budget) so I’d really love to read this book! I have been thinking about going green although the only thing I have done so far is use the energysaver light bulbs. I want to get some energysaving appliances, but can’t afford them at the moment. I would love to use this book for more ideas on how to start this process sooner. Thanks for the opportunity. Would love to own this book – thanks!! I’m all for going green :) *Thanks* for the giveaway! Would love to get a head start… we’re thinking about baby! I love the idea. I’ve been trying to reduce my family’s wastefulness as is. I need more guidance on how to raise a baby simply and without all the extra waste. Thanks for bringing this book to our attention! This looks like something I need to read! What a GREAT giveaway! I’d love to read this book. I would really love to read this book. I try to be green, but I have a husband that has a hard time being green. Maybe the book would help. We were planning on getting diapers from Gaiam that are mostly material with an insert to be green to the environment. We are trying to have a baby. I would love to know more simple ways to be earth friendly. would love to check this book out and make some changes. I would love to win this. It is on my amazon wish list! Thanks. Help me to live green! Sounds like an excellent book! With baby coming in May, I should start reading now! WE just found out were pregnent…what timing! Sounds like the perfect gift for my best friend who just announced her pregnancy! My oldest son is constantly trying to get me to go green. Old habits die hard. my husband is JUST beginning to cooperate with my recycling efforts, so this would certainly help us out! You always have a giveaway for the best products available to our little ones! I would love this book. It seems like the book contains a bunch of great advice how to “go green”! Sounds like a good place to start if you’d like to “go green”. I’d love to read it! I would love to find more ways to raise my son green. We are trying to move more and more green all the time. Please, please enter me! What a great giveaway!! This book looks great…I’d love to win! Looks like a timely & important book. One I definitely should read. My daughter is pregnant and is talking about making changes. She doesn’t really know where to start; this book would help her a lot. This looks like such a fabulous book…we’re starting out in the process and I would love to be prepared from day 1! I’m so glad you posted about this book…even if i don’t win i will be purchasing it, as we are in the process of getting ready to have a baby and are very concerned about the environmental and ethical issues involved. I would love to win this book. We’re due in May and are struggling to maintain our green ethic amidst the baby-industrial-complex. Wow! I just checked this book out of the library and was pleasantly surprised to see it here. It is really good, as it goes beyond just baby things. There is stuff about keeping a green house and how to conserve energy. A lot of things in here I was already aware of, but I like that the author isn’t too preachy. This is an especially timely book with all of the scary toxic things that are coming to light regarding kids toys and harmful additives in health & beauty products. Highly recommended read! This woudl be a fantastic addition to our library – we’ve been looking for a book like this. Sounds like a great way to learn about helping our environment from an early age. I’ve been looking for information to green my baby(due in June), and this is definitely the book I would like to read. Thanks! Thanks, its very important that our next generation be even greener than us..we’ve only just started. Sounds like an informative read. This looks great! I’m interested in reading it. To live green with baby is to believe and plan for their future and your present. Any information on how we can save things for our future generations (Even if they never know it.) The better the earth is! You have the greatest giveaways! I am so into “going green” for my little one. Love this! I’d love to read this book! My husband and I are trying to think of all the ways we can be more ‘green’ conscious. I love anything that can help me live greener. thanks for another awesome giveaway steph! Wow, I would LOVE to read this one- we’re trying to become a “greener” family, one step at a time!